Spectiv is a platform that enables users and organizations across the globe to stream unique virtual reality content (“VR”). Viewers can discover, share and experience the full capabilities of VR in the comfort of their homes. Spectiv’s mission is to offer the truly immersive power of VR to everyone. The Signal Token (SIG) Protocol is designed to decentralize the buying, selling, and rewarding of attention across media platforms by removing centralized intermediaries from advertising transactions. • Advertisers are the driving force in this market vertical; that is, they are the purchasers of attention. • Publishers are the producers of attention. By publishing quality contributions, they drive audiences to view their media content. • The viewers are the “commodity” of the platform, providing the raw attention that advertisers value. • Curators are the influencers of attention and share content with their unique audience of engaged viewers. It follows that advertisers should buy or reward attention by interacting directly with publishers, viewers and curators. However, this is not the case today in advertising. Advertisers pay for campaigns through centralized entities that act as attention brokers between advertisers and publishers (Google, Facebook, LinkedIn etc.). This creates a barrier that advertisers and media publishers must funnel through to reach viewers. As such, these intermediaries control access to, and the management of, attention data insight related to advertising campaigns. This leads to the charge of substantial matchmaking fees. 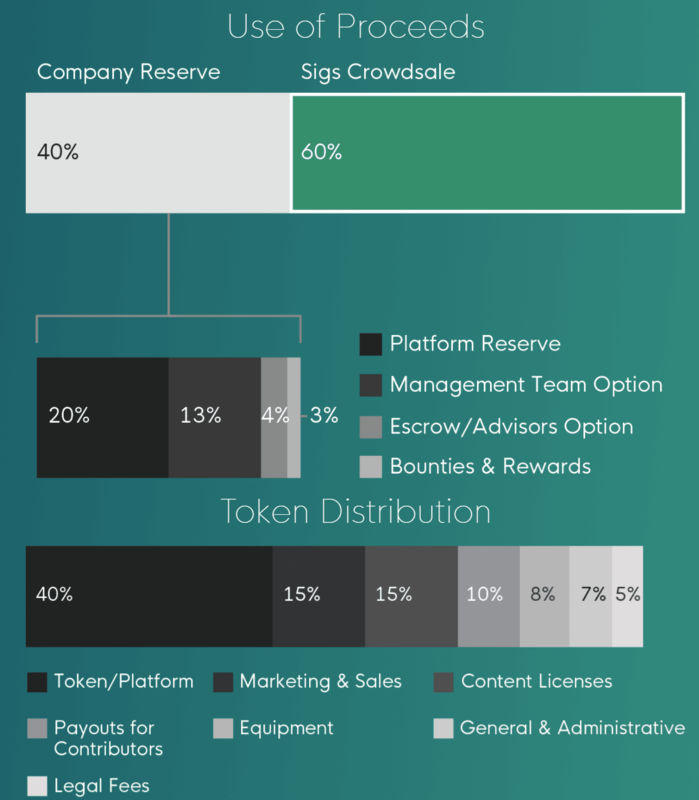 Spectiv is the creator and initial adopter of the Signal Token protocol. This protocol decentralizes the interaction between advertisers, content publishers, viewers, and curators. It is opensource and is intended to be built on by other media platforms. It removes middlemen from the transaction through Ad Campaign Smart Contracts. Using the Protocol, an advertiser can use SIGs via a smart contract associated with target content. This content is now active, or “hot” which means publishers, viewers, and curators can engage with that advertiser through the smart contract and be rewarded with SIGs for driving attention to that content. Every ad view, click, and reward that occurs is communicated to the Ad Campaign Smart Contract through a third-party oracle. The Ad Campaign Smart Contract then autonomously distributes SIGs to the users participating in that engagement. By utilizing smart contracts, a publicly verifiable blockchain, and trusted oracles, this protocol can directly disintermediate the “trade” of attention. The Protocol enables advertisers to execute ad campaigns by directly rewarding the producers, providers, and influencers of attention – rather than going through a broker. Advertisers can target their smart contract to a wide portfolio of content or even one specific media item. Advertisers choose the budget of their campaign by committing the exact number of SIGs that they want to be dispersed. Set custom conditions for the smart contract reward participants, for example, .01 Sigs rewarded per ad click or .05 Sigs rewarded per ad click. This supports a transparent, competitive marketplace, where participants compete for the highest-rewarding smart contract. Advertisers can then visibly aim for low-cost, or appropriate and effective cost campaigns. This provides a reward opportunity for all participants. The Signal Token Protocol was specifically designed for use by Spectiv platform. However, it will be necessary for real world advertisers to engage with SIGs, therefore the protocol will accommodate more than just Spectiv content and users. Any ad-driven media platform can use the Signal Token protocol whether it is video-based, audio-based, written-based, or mixed. SIG’s utility has been designed to have multiple uses across attention ecosystems and media platforms, thereby ensuring the long-term viability of the protocol. Community-Driven VR Content: enabling ordinary users to stream any personal experience with their own VR equipment. This content can range from professionally produced to casually recorded uploads. Commercial VR Events: live streaming sporting events, concerts, and more from premium seat proximities for a truly engaging perspective and enabling viewers to not only watch popular events, but to be fully immersed in the atmosphere remotely. Spectiv OriginalsTM: originally produced VR content by Spectiv, voted on by the community; users decide what they want to experience. Spectiv’s competitive advantage above other VR streaming platforms is its community-driven focus. Spectiv is a user-integrated market of virtual reality experiences. It is not just an interface for viewers to watch popular VR events through – it is an environment where users from across the world can share their real-life experiences with others, thereby generating content that has unique value and can be shared with others as a curator or publisher. The Spectiv Platform will also incentivise platform use through token ownerships, thus creating an active user base from launch and traction for the ecosystem. This will turn users into platform advocates who support the growth of content, advertising, and viewership and act as ambassadors who increase the platforms visibility and its organic reach into the evolving VR marketplace. Any reward transaction for activities on the platform amongst users happen between user-controlled wallets, not on the platform, thus reducing load and systemic security risks. These transactions are also automatically processed by smart contract on the blockchain.